Perfect for families and couples, the Tofinis offers guests good quality accommodation and a friendly, informal atmosphere in which to relax. Enjoying panoramic views of the surrounding area, the hotel's own pool is a lovely place to lounge, soaking up the sun. was not really expecting much as this was only a 2.5 star and got a cheap last minute deal. I was quite suprised by the complex. The rooms could do with updating but they are clean enough, im used to 5 star hotels but it was good enough for me, its not the type of place where you have to complain and get moved. the views are stunning over by grecian hotel. Didnt use the bar or restaurant but it looked very nice. We hired a car but it was not far to walk into the centre at night, its closer than if you stopped up by nissi beach. we arrived late at night and was greeted by the receptionist we did not get shown to our room which was disapointing, the room were basic but had everything you needed and was cleaned on a daily basis. the food was good and had alot to choose from. the location was the main downfall it was about a 15min walk but only 4cyp to the town. the staff were all friedly and made us feel welcome. we would consider coming back! one of our best holidays. Myself and 2 friends stayed in the tofinis apartments for 2 weeks from the 4th july 2007. I would consider tofinis to be the best accomondation i have stayed in. I cannot complain about anything it was clean, peaceful and friendly. The room consisted of a bedroom with twin beds air con (which gets very very cold... which is what you need),2 dressing tables with mirrors, therefore there was no waiting on a mirror when trying to get ready (particulary ideal for the ladies). Along with this the bedroom was very spacious with enough wardrobe room to put all your clothes and other things in. The bathroom had both a shower and a bath which was rather big, again very clean and spacious. The main room included a kitchen area with fridge, toaster, kettle, etc. Also within the main room was a dining table and chairs, some sitting chairs and the third bed. Again a very spacious room. The bedroom and main room both had a door that led out onto the balcony, which was nice to chill out on before going out, particulary if you had an inland view of the pool, bar, beach, etc. The apartment itself had an indoor steak restaurant and an outdoor restaurant, located next to the bar. The reception was 24 hours in which you could leave your key with them if you didnt fancy taking it out with you on a night. The reception area also provided safe boxes, internet and telephones. The pool area was very clean, and the pool itself was very big. We loved the fact that no matter what time you went to chill out by the pool there was always sunbeds and umbrellas available. We usuallly spent most dasy round the pool as it was nice and breezy, due to being located on an hill. The beach was literally a 5 min walk outside the apartment- if that. The staff were excellent, very welcoming and friendly throughout the holiday, always at your service. Also on a night its very peaceful as the staff don't tolerate any noise, and had a security guy (brijesh aka ghandi) on guard overnight. Overall staying in tofinis apartments made our holiday one of the best holidays ever, i would definately return ayia napa and stay in these apartments. We arrived at Tofinis at 7.30am after a very long flight with our 14month old daughter,ella. after dragging our cases up to reception we were greeted by a nice receptionist who gave us our key and showed us to our room (we requested a high floor when we booked in march 2006 and we got it!). Rooms were clean and had a good lay out, we booked a 1 bedroom apartment, it had 2 doors to the balcony, 1 from bedroom and 1 from living room, so we could have a drink on the night without waking ella. The air con was absolutley brilliant, the coldest we've ever used! this was very useful as on the hottest day it was 48 degrees C.
The bar was brilliant, really good prices both for food and drink. food was lovely it had a really good choice, not just the usual burger and chips! 2 different menus, one for day and one for night. The pool was massive and had plenty of loungers, the best thing about it was the breeze as you are on the top of a hill, it really cooled you down. it had a good mix of families and couples, not too many teenage gangs. any mis behaving was stopped by the staff which was good. We only have one small problem with this hotel and that is the location, it is the 2nd from last hotel out of Ayia Napa. It is on the top of a very steep hill, which wares you out when you've got a buggy to push. The closest bar is 10 minutes away down the hill. but the pint you have at tofinis when you get to the top is always the best one of the day!! We have just returned from The Tofinis Apts in Ayia Napa.We were a mixed group of 8 and our ages ranged from 24 to Fiftys. It was fantastic very clean and in a lovely area, far enough from the town if you did not want a rowdy night but easy enough to walk to aswell.The Pool was fabulous and the staff were great. We all enjoyed it so much we are all going back same time next year.And the food was very good they do a mean breakfast!! We stayed at Tofinis in Aiya Napa. We had a one bedroom apartment. The kitchen equipment was very limited, but the in house bar and restaurant offered really lovely meals at great prices, so the only thing we felt the need to make in the apartment was toast and cereal for the children first thing in the morning. The apartment was clean and had all the basics, which is all you need on holiday. You can have air conditioning if you pay a little extra-not necessary in May, but probably very welcome in July and August. All the staff were friendly and helpful, and very patient with the children. When we returned from Aiya Napa with a 2 year old with burnt fingers they rustled up antibiotic cream and a big bag of ice immediately. On another occasion the receptionist very patiently spent time with the 7 year old sorting out his Internet access. The pool and pool area were immaculate, with loads of sunbeds and umbrellas. In fact, the whole site was beautifully maintained. The views from the pool area were stunning, especially at dusk, when the resort started to light up. It is near enough to the town centre to walk in with 2 small children, but as home is uphill nearly all the way, we got cabs home. I would recommend this hotel to anyone who is looking for a clean family friendly place to stay. After arriving at the Tofinis we went staight to the bar - as you do when your on your hols! The first thing we noticed was how friendly the staff were. We were greeted by Jimmy the barman/manager, he`s full of useful information on Ayia Napa/Cyprus so if there`s anything you need to know he`s your man. Rooms are spacious and cleaned daily, some rooms have fantastic views of the resort. The Tofinis apartments were clean and tidy - the apartments all overlooked the pool/sea and were spacious inside. The only thing we'd say is that they could possibly do with updating the interiors, however, we would definately stay there again. The apartments are ideally located - about a 20min walk into the centre and just over the road from a lovely clean beach. There is a taxi rank outside as well as a bus stop with a regular bus service to Ayia Napa and Protaras. We were self-catering, however, there is a restaurant/poolside bar which offers a good choice at reasonable prices - we all ater here everyday for breakfast or lunch and the restaurant was always full on an evening although we did prefer to go out and about. The bar was open till late as we often had a nightcap when returning from the pubs, the staff tend to serve until people go to bed. 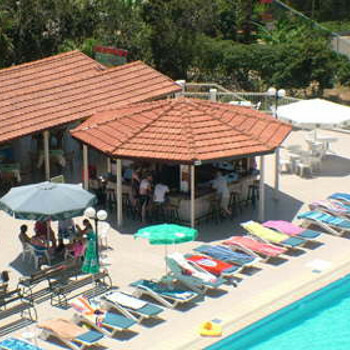 The staff here are very friendly and chatty and the pool and surrounding area is kept immaculate. We would definately visit the Tofinis again. I have stayed at the Tofinis hotel twice, the second time was for my wedding! The location is fabulous, close enough to walk to the square yet far enough that it doesn't disturb you. The staff were very friendly and extreamly helpful at all times. I have recommened this hotel to many friends and family and will continue to do so.